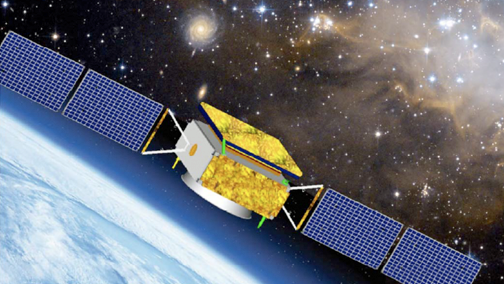 An artistic rendition of China's DAMPE satellite. Image is courtesy of the Chinese Academy of Sciences. The latest measurement of energy spectrum of cosmic-ray electrons and positrons by China's Dark Matter Particle Explorer (DAMPE) satellite could provide important information to scientists who are searching for the elusive dark matter, according to a study published Wednesday in the journal Nature. Nicknamed "Wukong," or Monkey King, the DAMPE satellite was launched into orbit in 2015. The satellite is equipped with instruments that can observe the direction, energy and electric charge of high-energy particles in space. In this study, the DAMPE Collaboration team reported direct measurements in the energy range 25 gigaelectronvolts to 4.6 teraelectronvolts with extremely high energy resolution and low background. Nature's Chief Physical Sciences Editor Karl Ziemelis told Xinhua that the spectrum of cosmic rays at high energies provides clues to the origins of these energetic particles, and these origins might include processes involving the still-elusive dark matter. "These latest measurements, reported in Nature, confirm the impressive potential of the DAMPE satellite for determining this spectrum," said Ziemelis. The team also find a spectral break, which is an unexpected drop in the number of cosmic-ray electrons and positrons seen at high energies, at about 0.9 teraelectronvolts, confirming previous indirect measurements. Since 2008, scientists have found "abnormal" phenomena within the one-teraelectronvolt cosmic rays, and some of them believed that such abnormality may be related to dark matter, Yizhong Fan, vice director of the scientific application system of DAMPE, told Xinhua. If it turns out to be dark matter, its spectrum at high energies may significantly differ from those from regular astronomical processes, therefore measuring the spectral break may help "clarify whether cosmic rays with energy range below one teraelectronvolt come from dark matter", said Fan. It is believed that only around five percent of the total mass-energy of the known universe is made up of ordinary matter, substances that we know, and the rest is dark matter and dark energy. Because dark matter does not emit or reflect enough electromagnetic radiation, finding it has proved to be a great challenge to researchers. It is still hard to know whether dark matter is a particle, a field or a misunderstanding of how gravity works. "The DAMPE satellite is starting to directly measure the properties of cosmic rays at energies that were inaccessible to previous measurements, so we are entering unknown territory — we do not know what it will find," said Ziemelis. "But whatever it finds will be new and contribute to our understanding of high-energy processes in our galaxy, regardless of whether they involve dark-matter particle annihilation." Article sourced from Xinhuanet, edited by Mu Xuequan.